It was wet it was soggy. The premiers were showing off their trophies. But they forgot there was a game to be played. Souths however turned up ready. In Bennett's first NRL outing in charge as coach he showed he means business in 2019. Souths played a classic wet weather game, keeping errors to a minimum and letting the forwards dominate. Then add a classic kicking game from Reynolds and Souths dominated the second half and rained on their party in another happy homecoming to the SCG. We are still very much work in progress as it will take five weeks of the competition to get used to the new style of master coach Bennett. Off to a good start but still 13 more wins to qualify for the semi's. It's all about collecting the two points at this stage of the season. So 2019 begins and Cameron Murray has already pushed out Sam Burgess from his regular lock position. Murray is huge across the chest and very strong generally. His defense is first class and is a mobile smaller forward. His line speed gets the opposition on the back foot. The junior NSW rep is already being talked about as a NSW SOO bolter. He is making everyone take notice - he is a Machine. Reserve Grade returned after 12 years at a wet and soggy Redfern Oval on the weekend. It was a tough slog against a new look Bears, with the lead changing 4 times before Tracey crashed through a tired defence to score the winning try. Injuries will determine our season but a good first up hit out. Our U18 boys had another heartbreaking loss. After being down early they did very well to crawl their way back into the game and be 20 all as we entered the final 10 minutes. But alas they let another game slip away in the dying stages of the match. This effectively puts them out of the running for this year's finals. We rest 6 players and the wheels just keep turning in another impressive win over our neighbours. That's 6 from 6 as we head into the bye and then finish the season with two top of the table clashes. This is just what we need to toughen us up for the finals campaign. Well the SFS continues along its way through it demolition, and over at Parramatta Western Sydney Stadium has had goalposts erected in readiness for a public open day. Labor continues to try and uses the stadiums refurbishment as an electron issue while Liberals continue to promote their infrastructure build works. It's D-Day this Saturday for the public to support one party or the other. If Liberals get up, its business as usual. While if Labor get up, all SFS works will be stopped. Fans will now wait to see the election result to understand the what is going to happen going forward. Statistically it was a good game in the wet conditions Completion improved to 76% from 68% last week. Errors dropped to 11 from 4 last week. We gave away 3 penalties compared to 12 last week. Souths Effective 1st tackle improved to a good level of 25.2m from 31.8m last week. Our missed tackles were at a good level of 21 missed tackles from 19 last week. Opposition offloads dropped to 9 from 3 last week. Looking at our left side defence - Graham-Burns-Walker-Sutton/Lowe (0-1-4-1) was dropped to 8 missed tackles from 6 last week. On the right side Gagai/Allan-Inglis-Reynolds-SBurgess/Lowe (2-2-1-2) was improved to 7 from 8 missed tackles last week. Ruck defence TBurgess/Knight-Cook-Tatola/Nicholls-Murray/SBurgess (1-1-1-1) was improved to 4 from 5 missed tackles last week. Our go forward improved to 1628m from 1412m last week. Knight, Gagai and Allan made 10+m per run. 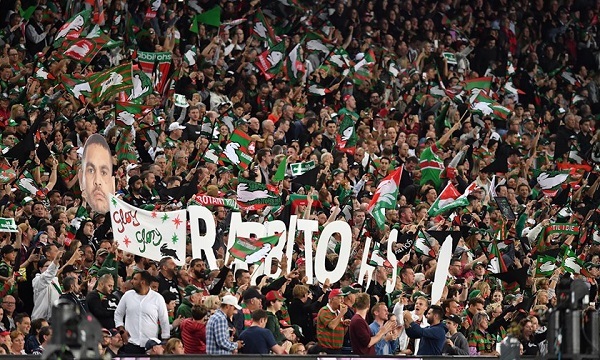 Sam Burgess, Murray, Tom Burgess, Sutton, Knight, Tatola, Burns, Gagai and Johnston making 100+m in the match. Defensively Cook was our best in the tackling raking up 40 tackles. Tatola, Knight, Graham and Allan didn't miss a tackle.